This perspective advocates a holistic view of photoinhibition from the molecule to the biosphere; a view that integrates many biophysical and biochemical processes in antennae and reaction centers of the photosystems that, when acting in concert, allow plants to respond to diverse and dynamic light conditions in many different environments. 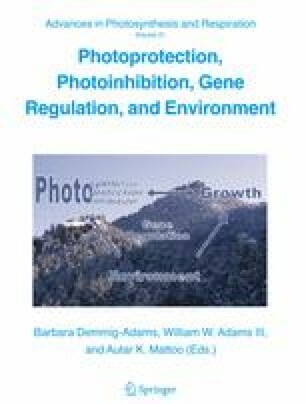 We take the general view that photoinhibition refers to a reduction in the efficiency of light use in the photosynthetic apparatus (Kok, 1956). Since the 1970s, biochemical, ecophysiological, and genetic studies of photosynthetic functions in strong light, in vivoand in situ, and their interactions with biotic and abiotic stresses, have significantly advanced our understanding of photoinhibition. We trace some origins of the idea then, that slow dark reactions, such as growth, CO2 assimilation, photorespiration, and photosynthetic electron transport, ultimately limit light use in photosynthesis, and thus determine whether light is in excess and the magnitude of “excitation pressure” in the photosynthetic apparatus at any moment. This and other ideas are followed through studies of photoacclimation in leaves of plants and algae from diverse terrestrial and marine environments. We highlight two currently interesting possibilities for the photoprotective dissipation of “excitation pressure” that reduce the efficiency of photosynthesis by changes in structure and function of antenna pigment-protein complexes and in the populations of functional and non-functional PS II centers. We conclude by briefly considering challenges presented nowby the discovery of “gain of function”, very high light resistant (VHLR) mutants of Chlamydomonas, by the accessory lutein-epoxide cycle, and by technologies for remote sensing of photoinhibition in the field.